For many rap and hip-hop artists, behind all the trash talking, posturing and flaunting the big life, it's all about business. Forbes magazine recently ranked the top 20 earners on its Hip Hop Cash Kings list, which spotlights male recording artists whose work is primarily classified as hip-hop or rap. Over the past 12 months, the big names on the list racked up a total of about $300 million. 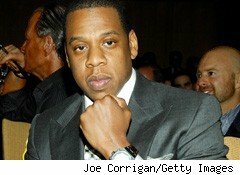 The cash crown for the second year in a row went to Jay-Z (pictured), with $63 million. No. 2 was Diddy at $30 million, followed by Akon at $21, Lil Wayne at $20 million and Dr. Dre at $17 million. These guys are brand masters: How else could they withstand the double whammy of an off-again-on-again economy and the technological revolution that has allowed consumers just download their favorite singles rather than buying entire CDs? Take Jay-Z, for example. He not only has a new album, a worldwide tour (which according to Forbes, is grossing more than $1 million per show on average), he co-owns the 40/40 nightclub chain, and he's a part-owner of the NBA's New Jersey Nets. He and the other Cash Kings bring in the Benjamins not just from record sales, but digital downloads, touring, films, TV shows, endorsements, books and other entertainment ventures. A couple of years back, rapper 50 Cent made the headlines after he reportedly received a $400 million paycheck after the Coca-Cola Company (KO) bought Glaceau, the firm behind his energy drink Formula 50. At the time, 50 Cent had a 10% share of Glaceau. "Many rappers are also making money by attaching their name to a clothing line, like Diddy's Sean John or Akon's Konvict Clothing label, perfume and other items they can sell to their fans," says Josh Gair, CEO of Impact Entertainment Services. "Sometimes they actually own the company, other times they are simply licensing their names for a royalty. Either way, it is a nice passive income," he says. Rappers are also expanding their territory. "Years ago, rappers would never have considered doing corporate bookings or private gigs like bar mitzvahs, but today the perception has changed and it is good money and they don't have to worry about ticket sales," says Gair. "We booked a big-name rap star for a bar mitzvah, and the rapper was paid in the high six figures," he adds. Relative newcomer Drake, according to Forbes, banked $9 million over the past 12 months, thanks to a new record deal, an advertising pact with Sprite and an agreement with Virgin America that plasters his likeness onto the sides of airplanes. And entrepreneurial rappers aren't locking themselves into a one-genre outlook. Look no further than Akon, whose Interscope-backed imprint, Kon Live Distribution, is home to superstar Lady Gaga. It wasn't always this good. Rap and hip-hop have come a long way. In the '80s, the industry saw the inception of the distribution deal, recalls Brett Wright, co-CEO and chief creative officer of Vibe magazine, which chronicles all things cool. Def Jam, the brain child of Russell Simmons and Rick Rubin, was one of the the first hip-hop labels. "Def Jam was the first big success," says Wright. Its success and that of others got industry attention. "The majors saw it as a big opportunity and began investing more money," he adds. Before long, there were multimillion dollar successes like Andre Harrell's Uptown Records, Death Row and Tommy Boy Records. By the early to mid-'90s, the production deals turned into joint ventures -- major labels partnering on a more equitable level with smaller ones, such as the Motown deal with Universal (VIVEF), the Def Jam deal with Island Records, among others, says Wright. "The big companies developed big artists like Mary J. Blige and Jermaine Dupri," he adds. The joint-venture business model helped the upstarts overcome barriers to entry with radio promotion, sales and distribution muscle, says Wright. But the days when rappers made the majority of their money from concerts, and record, T-shirt and poster sales are long gone. "In the '90s," says Wright, "the hottest artists could make $10,000-$20,000 a show, sell thousands in merchandise and sell records at the store, and there were publishing royalties. Now the record sales have become a much smaller piece, if you're not in the 1% to 2% of the big name artists." The Internet changed everything. "The net had a big play in how dramatically the business shifted. Not overnight, but quickly," says Wright. Napster threatened the record industry's business model. Labels fought the technology and lost significant battles, says Wright. iTunes now accounts for 30% to 40% of all music sales, he notes. But the Web has also given rise to a generation of pirates who have cut into the labels' revenues. Some black music divisions died because of shrinking revenues. But technology would prove a boon for new rappers who could get their own music out there on shoestring budgets. Today, it's all about YouTube and social networking. "If you can get 500,000 downloads of a song then you can go to a label and show a track record," says Wright, highlighting the upside of the technological changes. "You can then do business on your own terms, you're not beholden to a record label." One example of a rapper who has committed full-force to the Internet model is Anthony "AZ" Cruz, who created HeyAZ.com, a digital platform for the hip-hop culture. AZ is best known for his collaborations with Nas and as a member of hip-hop group The Firm. HeyAZ.com acts as hip-hop museum, social network, and online mobile music and media zone. It all seems like something from a galaxy far, far, away, compared to 1979, when the Sugarhill Gang hit the airwaves with what is viewed as the first big rap song, "Rappers Delight." For a long time those lyrics stuck, "Just throw your hands up in the air and party hardy like you just don't care. Let's do it don't stop y'all, a tick a tock y'all, you don't stop, go hotel motel what you gonna do today (say what)." At best, back then rap and hip-hop was dismissed as a passing, urban fancy. But more than 30 years later, it's still here, with its own piece of the business world, not totally unlike Wall Street. Both have plenty of gangstas who live large, take risks and are driven by ka-ching -- mo' money, mo' money, mo' money.